Sometimes it takes a talented author and a great audio crew to get my attention. No matter when Thanksgiving occurs in your country, it is a perfect holiday for freelancers’ articles. I had forgotten the story of the Pilgrims finding an English-speaking native in the land that would become America. Others may not have heard it, so it’s a great twist to our Thanksgiving story. Find a unique topic for this year’s Thanksgiving celebration. Look for a different twist (such as Squanto, for Americans). 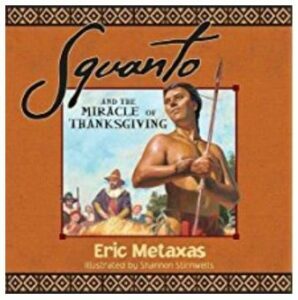 Squanto and the Miracle of Thanksgiving provides a quick, easy, curl-up-on-the-couch-with-your-kid reading moment. Children love it and it isn’t boring for the adults … so here I am, telling you about it. Here are Eric’s and Amazon’s URLs to the book. Happy Thanksgiving to my readers in the U.S.A.
And Happy Thanksgiving to you and yours Kathie! It’s such a blessed time of the year. “We didn’t catch it.” An expensive lesson in proofing our own work.